Today has been interesting to say the least. Started out prime when I found a deal on a new suit worth $600 for just $90. Score. Then things took a turn when we accidentally locked our keys and tablets in the family history center😂 hahaha. Needless to say, we were stranded at the church for quite a while, but all is well. So, I have less time to write but I’ll try to type the most I can. We’ve been keeping busy here in Alex. Still meeting tons of new people and finding new blessings in store for us every day! Remember that inactive member from Lakeville that just so happened to be our next-door neighbor? Well we had dinner with him this week. He’s awesome! And guess what, he surprised us and came to church on Sunday! First time in over a year. Super glad we were able to make a connection with him. 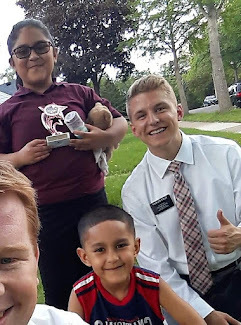 We taught Milo, the Spanish recent convert in our area, and his two boys again. They are doing great and we are preparing for their baptism next week! We felt prompted to call this media referral from Texas who was never contacted. She picked up and wanted to meet with us the next day! It was sweet, her name is Jane and she brought her boyfriend to the church and we gave them a free tour! They have both gone through so much. Her former husband committed suicide, and he got in a car accident and broke his neck. They both are pretty depressed and just looking for peace. It was amazing to be able to testify of the peace that comes from having faith in Jesus Christ. It was a really cool moment when we explained the purpose of our life, it just clicked with her, she said "wow I've never heard it like that before. That makes so much sense!" And afterwards she leaned over and started to explain it again to her boyfriend and was like, "See! If Adam and Eve didn’t sin, we wouldn’t be here to be able to grow!” It will be hard to meet with her regularly because she works 2 jobs, but hopefully we can see them progress in the gospel. We also had zone conference this week. It’s a little different when you’re a 3-hour drive away from it, haha! But it was still good, we spent the night at the zone leaders’ apartment the night before. We had a really powerful training on how we can improve our personal prayers! President Barney showed us some clips from Russell M. Nelson and I just love this quote: “Nothing opens the heavens quite like the combination of increased purity, exact obedience, earnest seeking, daily feasting on the words of Christ, and regular time committed to temple and family history work.” So true! We’ve still been trying to find more Spanish peeps to teach. We saw la familia Maldonado again! Sadly, something happened and they didn’t make it to church. But we contacted a guy who ordered a copy of the Book of Mormon online and happened to be from El Salvador!! I’m surprised at how much Spanish I still use in this area, talking to people, translating at church, so that’s been a great blessing to keep practicing my Español! Last but not least, our buddy Jordan from China! We had a lesson with him, and honestly it was pretty difficult haha. It's a little weird transitioning from teaching Hispanic people where knowledge of God and faith in Christ just come naturally in their culture. Jordan's only exposure to religion has apparently been from watching American Horror Story😂. So, instead of trying to answer all of his questions we only focused on prayer. The spirit was a lot stronger, and he was able to say his first prayer! He’s progressing well, we just need to take it line upon line. 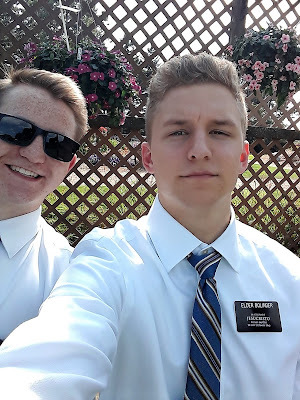 Elder Harris and I are having a ball out here! 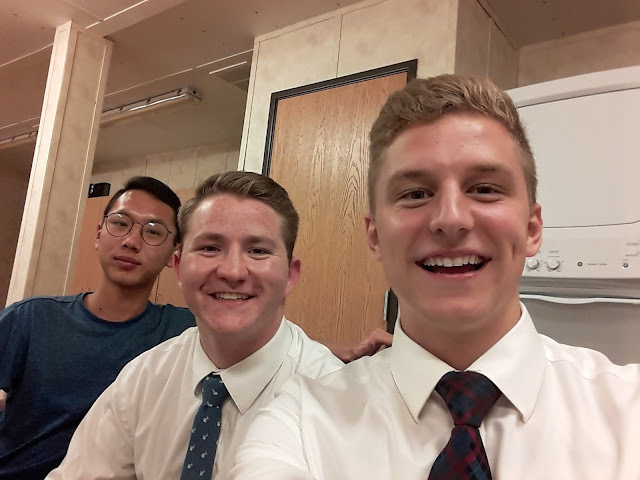 I've enjoyed meeting so many of God's children in the area already and I'm so grateful for this chance I have to serve them and serve my Savior. I know He lives!